Update: Since December 2014, I work for TopQuadrant. This website is in dire need of a general overhaul… In the meantime, there's LinkedIn. Linked data technologist at the LiDRC, DERI Galway, Ireland. DERI, Linking Open Data project, Pedantic Web Group, Web Science Trust fellows. A web site that simplifies a common task in the work of RDF developers: remembering and looking up URI prefixes. I'm a co-founder of this group of people dedicated to fixing broken data on the Semantic Web. I am a member of this W3C working group. It is chartered to create a specification for a language to map relational data and relational schemas to RDF and OWL. An entity search engine and browser for the Web of Data. Built with Michele Catasta and Szymon Danielczyk in the OKKAM Project. 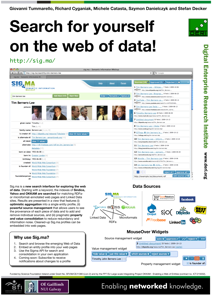 Sig.ma won 3rd prize at the 2009 Semantic Web Challenge. Anything To Triples (any23) is a library, web service and command-line swiss army knife for parsing and converting RDF. The codebase is extracted from Sindice and maintained by DERI and FBK's Web of Data Research Unit. An open-source project aimed at making relational databases part of the Web of Data. Originally founded by Chris Bizer. I have maintained D2RQ and D2R Server since 2005. An open-source publishing platform for RDFS vocabularies. Currently in Alpha stage. I founded this project in 2008. 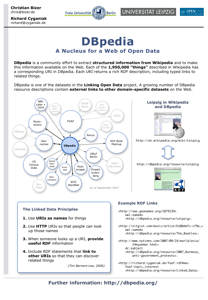 Extracting structured RDF information from Wikipedia. A large community project involving several universities and companies. I have contributed to the original extraction framework and have developed and maintained DBpedia's HTML frontend during much of 2007 and 2008. 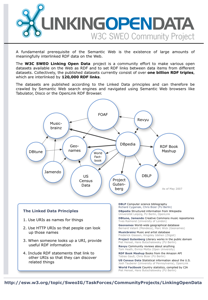 A community effort to convert existing sources of open data to RDF an make them part of the Semantic Web. I'm a co-founder of the project, together with Chris Bizer. My main contribution is in helping to establish best practices for publishing RDF on the Web, and maintaining the LOD dataset cloud diagram. 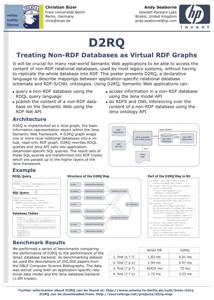 A proposed standard for improving RDF discovery, originally designed by Giovanni Tummarello. A work-in-progress RDFS vocabulary for describing the contents of RDF datasets. 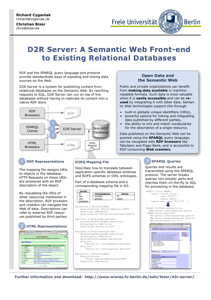 A Linked Data server that exposes RDF data from SPARQL endpoints. Originally developed for DBpedia. An experimental search engine for the Web of Data. The project is lead by Giovanni Tummarello. I was a member from 2007 to 2009. StatCVS generates colorful reports from CVS repository logs. I maintained the open-source project from 2002 to 2008. A port to Subversion, called StatSVN, was created by Jason Kealey and Benoit Xhenseval. They took over maintenance of StatCVS in 2008. A simple RDF browser. Developed together with Tobias Gauß in 2006-2007. 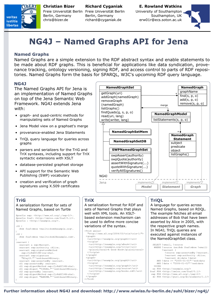 NG4J provided support for Named Graphs long before this feature became standard in all RDF stores. The project was initiated by Chris Bizer in 2004, and I maintained it from 2004 to 2007. An early attempt at implementing expressive SPARQL queries over a database-backed triple store. I did this as an internship project at HP Labs Bristol in 2005 under the supervision of Andy Seaborne. A policy framework for Web Information Quality Assurance, part of Chris Bizer's doctoral thesis. I did parts of the implementation (2005-2006). Some very old projects. Page in German. I occasionally blog at dowhatimean.net. There is a list of my very old publications (page in German). Once upon a time, I did some blogging in German here. Keith Alexander, Richard Cyganiak, Michael Hausenblas, Jun Zhao. Specification, 2009. Tom Heath, Michael Hausenblas, Christian Bizer, Richard Cyganiak, Olaf Hartig. Tutorial at ISWC 2008, Karlsruhe. Published at videolectures.net. Richard Cyganiak, Andreas Harth, Aidan Hogan. Specification, 2008. Leo Sauermann, Richard Cyganiak, Danny Ayers, Max Völkel. W3C Interest Group Note, 2008. Richard Cyganiak, Renaud Delbru, Giovanni Tummarello. Specification, 2007. Christian Bizer, Richard Cyganiak, Tom Heath. Tutorial, 2007. Chris Bizer, Richard Cyganiak. Specification, 2007. Christian Bizer, Sören Auer, Richard Cyganiak, Georgi Kobilarov: DBpedia – Querying Wikipedia like a Database. 16th International World Wide Web Conference (WWW2007), Banff, Canada, May 2007. 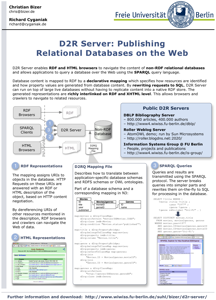 Richard Cyganiak, Christian Bizer: D2R Server – Publishing Relational Databases on the Web as SPARQL Endpoints. 15th International World Wide Web Conference (WWW2006), Edinburgh, Scotland, May 2006. Some day I will upload all my presentations to my SlideShare account. For now, just some notes. All of these are made with OmniGraffle. On some, I have contributed not as an author but only by creating the poster itself.